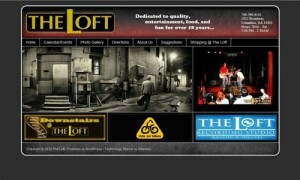 The Loft 2010: One summer in 2010 Tom Jones, the manager of Downstairs at The Loft, let me learn how to make website by creating him this WordPress site. This was the start of my Web Development career, and the first website I had ever done! I sat in my moms kitchen for 40 hours a week for the three months of summer trying to figure out how to use WordPress, and through the use of plug-ins and HTML I made the site which lasted for 4 years. It was a great learning experience and I thank my friend Tom Jones for letting me work with him on The Loft. All of the code and maintenance was performed by me alone.